Covering the quagmire that Venezuela has become in a fair way has always been the main purpose of Caracas Chronicles. As bloggers we try to unveil to the world what’s really happening on the political, economic and social fronts, providing our humble analysis of the status quo. Yet recently it has become extremely hard to justify our arguments given the insane scantiness of official statistics. Even more, as the country attempts to miserably parry off the gloomy economic outlook ahead, it seems that the government exerts more effort in hiding the truth and keeping people uninformed of what’s going on, than actually governing. Today, we Venezuelans do not know for sure whether our economy is worth $300 billion or so at the official exchange rate … or $20 Billion at the black market rate. The last time we heard anything about official scarcity levels from the Central Bank was August of last year. It”s pretty much the same story with balance of payments data, CPI numbers, or whatever. The World Bank claims that, according to our official data, we’re an upper middle-income country (the canard keeps on and on). What’s more dreadful is that these delays in the release of the data dampen the credibility of both our national statistics and our institutions. Just last week, The Economist magazine published an article tackling this very issue. Not only is the Government witholding the information or tampering it, but it harasses and locks-up anyone who dares question their narrative. This demeanor might have a sound reasoning according to Javier Corrales, a political scientist and friend of the blog. In a chart in the aforementioned article from The Economist, his research shows a staggering decline in the number of newspapers, TV & radio stations (local and nationwide) since 1998, meaning less accountability or oversight from the independent media … or what’s left of it. Under these conditions, social networks might give an edge to civil society, but in Venezuela internet penetration is one of the lowest in the region (not to mention it being one of the slowest), so fewer Venezuelans have access to information. You can check some of Prof. Corrales’ slides from an event in Miami 2 months ago speaking about this very topic of Venezuela here. 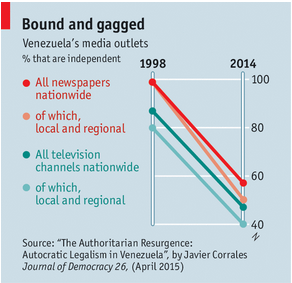 This is why our fellow blogger Gustavo Hernandez, among others, tracks the constant harassment of what’s left of the independent media from what he labels the Hegemon, Corp, and its gangster gambits such as the “aggressive-takeovers” of an independent media outlet Chavismo-style. For example, did you know that El Universal was apparently bought by Tareck El-Aisami? Deep down, the government is not worried about Venezuela’s truculent morass. It’s only worried about what people say about it.